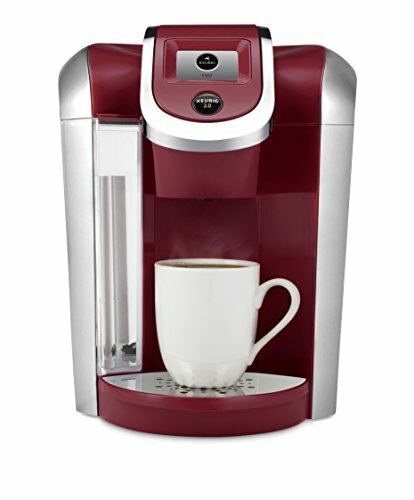 Are you considering upgrading from your regular Keurig brewer to one from the 2.0 series? If so, you might want to consider jumping right past the K250 and go straight to the Keurig 2.0 K350, which has a few more features for pretty much the same price. With the K350 brewer, you can make up a four-cup carafe of coffee just as easily as you can a single cup with your old Keurig, and it is going to taste just as great. This coffee maker uses the amazing Keurig 2.0 brewing technology, which reads the lids of the K-Cup and K-Carafe pods, so you get a perfect cup or carafe, every time. In this Keurig K350 review, we’ll teach you about the pros and cons of this popular model. Who is the Keurig 2.0 K350 for? What’s Included with the Keurig 2.0 K350? 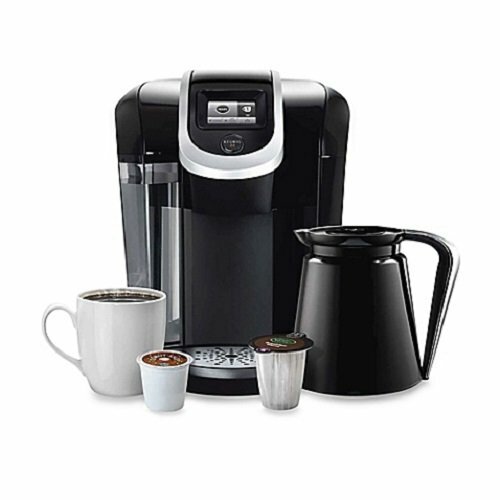 The Keurig 2.0 K350 lets you brew a four-cup carafe of your favorite coffee just as easily as you brew a single cup. It is so easy that all you have to do is press a couple of buttons, and in a minute or two, you will have a pot of fresh, hot, delicious coffee. This brewer features the Keurig 2.0 brewing technology, which reads the lids of K-Cup and K-Carafe pods. The only drawback to this is that it will not read the lids on generic pods. But, you can make other delicious specialty beverages, including tea, mochas, lattes, and hot cocoa. This brewer features a 60-ounce water reservoir that lets you brew four to five cups of coffee at a time, depending on the size of your cups, and you can still brew a single cup if that is all you need. It has a 2.4 inch interactive, black and white Touch Display, with a strength control setting that lets you brew coffee as strong as you like it. It comes with all of the accessories you need to start using it right away, and there are also many optional accessories you can get to go with this brewer. One of the biggest drawbacks to earlier Keurig machines is that the only K-Cups you could use were produced by Green Mountain Coffee. But, one of the reasons why we love the 2.0 series, including the K350, is that there are many more choices available now. There are more than 400 varieties of coffee, tea, and specialty beverages to choose from, made by over 60 major brands, and you can even make iced drinks, including iced coffee and iced tea. As long as the pods have the Keurig logo on them, they can be used in this brewer. The Keurig 2.0 K350 is for anyone who loves a good cup of coffee. Whether you are in a household that requires a full carafe brewed each morning, or a student in a small dorm room who only needs a single cup, this is the machine for you. This is also a great little brewer to have in a small office, and it is ideal to have for club meetings when you need to serve a few cups of coffee. Whether you want to brew a full carafe or a single cup, you are likely going to love all of the features of this brewer. This may not be the best option for someone who is on a small budget, as it costs around $150. But, since you can make a single cup of coffee each morning and not have to go out and buy one, you will actually be saving a lot of money in the long run. You could even end up saving upwards of $10 every day, so after a while, this machine will have paid for itself, and it will have definitely been worth the price. 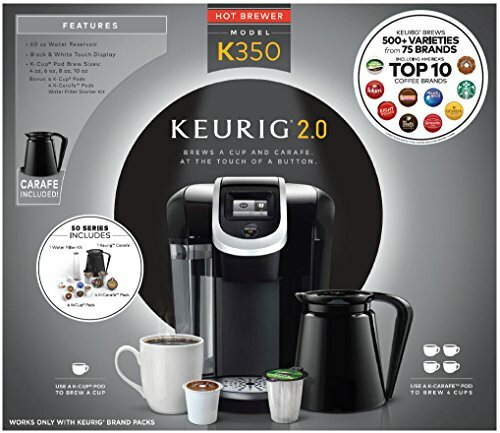 As soon as your new Keurig 2.0 K350 arrives, you can set it up and start using it right away, because everything you need, including some K-Cup pods, will be in the package. The brewer comes with a Keurig Carafe, Keurig K-Cup pods, K-Carafe pods, and a water filter. So, you don’t even have to run out and buy coffee to make, unless of course there is a specific type that you really want to try. In addition to the accessories that come with the machine, you can also get some cool optional accessories, including the Keurig 2.0 Carousel, the Keurig 2.0 Storage Drawer, the Keurig 2.0 water filter starter kit, and a thermal carafe. Check out this unboxing video to see what the brewer looks like right out of the box. If you have never used a Keurig brewer before, it is important that you take some time to read the instructions and learn how the various functions work. This is a super-easy brewer to use, and once you get the hang of it. Pay special attention to the strength setting, because you can use it to customize your own perfect brew. The Keurig 2.0 K350 has a few more features than its predecessor, and they are definitely features that anyone would want in a coffee maker. For starters, you can actually make delicious, cold beverages without having to use a separate machine. If you want to brew up some tasty iced tea, you can have it ready in just a few minutes. You can also make iced coffees and other chilled beverages. Let’s take a look at some of the other cool features this brewer has to offer. In addition to being able to brew a single cup of coffee, you can use this brewer to make a full carafe (four cups up to 10 ounces each, or more with smaller cups) to serve multiple people. It is just as easy as brewing a single cup, and you can have coffee for four in just a few minutes. The brewer reads the lid of each pod, so it knows whether you are brewing a cup or a carafe. You don’t even have to fiddle with any special settings. This brewer has a 60-ounce fresh water reservoir, so you can make a lot of coffee without having to refill the reservoir. You will need to check the reservoir occasionally to make sure that it still has water in it, and you should also change the water every day so it is always fresh. Remember, the fresher the water, the better your coffee is going to taste. The water reservoir comes off easily, and it is washable. All of the controls on this Keurig brewer are easy to use, and accessible through the touchscreen. It has a black and white display, measures 2.4 inches, and is backlit, so it is easy to read. Some of the things you can do with the touch screen include controlling the strength of your coffee and choosing your preferred cup size. If you use the default setting, you will automatically get an eight-ounce cup of coffee. You have the option to sample over 400 different types of coffee, from 60 of the most popular coffee producers in the world. This was not an option prior to the 2.0 series, which only would make coffee from one brand, Green Mountain Coffee. You can still get your Green Mountain in Keurig K-Cup and K-Carafe pods, but there are many more options to choose from now. A lot of coffee makers are lightweight, and they tend to break easily. The Keurig 2.0 K350 is a lot heavier than other machines, making it much more durable. With the reservoir empty, it weighs just under 14 pounds. This machine measures 18.3 inches high by 12.7 inches wide by 16 inches deep. It is large, but not so large that it won’t fit nicely onto most countertops, even in small dorm rooms. One of the best features on this brewer is that even though you can only use the actual Keurig K-Cup and K-Carafe pods, you can use a Keurig reusable K-Cup. This means that you can brew your favorite coffee, even if it isn’t one of the many brands that offer K-Cup pods. It is easy to use, and just as easy to clean and store for later use. Every Keurig coffee maker comes with a one-year manufacturer’s warranty. This means that if you have any issues with the machine that are manufacturing related, you can return it for a refund or an exchange without any hassles. Simply contact customer service to have any issues you have taken care of by friendly agents who want to help. We would be remiss to talk only about the great features of this coffee maker. Like any product, there are some things that people don’t like about the Keurig 2.0 K350. For instance, if there is no Keurig logo on the K-Cup pods, you can’t use them, which means you can’t save money by using generic brands. Also, there have been reports of some users ending up with coffee grounds in their cups after their drinks are brewed. Some people have reported that the touch screen can be “touchy” (no pun intended). Using the Keurig 2.0 K350 is pretty straightforward. So, instead of talking about the various controls, we thought you might want to know how to change the replaceable water filter. You can use water that has been previously filtered, but by using this filter, you are going to be able to save yourself a few steps. First, it is recommended that you use the filter kits that are made for these Keurig brewers. They are designed to work with the Keurig brewing technology. The starter kit will come with four pieces: an upper filter holder, a lower filter holder, and two cartridges to last for four months or 120 water tanks. This kit is compatible with the K350, as well as other Keurig 2.0 brewers. Start by programming the brewer to enable the water filter reminder on the touch screen. To do this, tap the “i” icon, which is located in the upper right hand corner. Scroll by tapping the right-pointing arrow until you reach screen 2 in the settings. The screen will show a message that reads, “Water filter replaced?” Hit Yes to set the machine. If you are more of a visual learner, check out this YouTube video about changing the filter. If you want to take things to the next level, there are other Keurig 2.0 options available, such as the Keurig 2.0 K400. This system also lets you brew a single cup or a four-cup carafe with the single touch of a button, and it has the strength control feature that lets you customize the strength of your brew. One feature that it has that is not available on the K350 is a customizable clock. There is also a wide range of programmable controls, including a Favorite setting. It uses the same technology that reads the K-Cup and K-Carafe pods, and gives you a perfect cup of coffee every time. Whether you are looking to brew a single, delicious cup of coffee for yourself, or you want to make a full carafe when company is over, you can do both with the Keurig 2.0 K350. Not only can you make over 400 varieties of coffee, you can also make hot chocolate, tea, lattes, and more. You can even make cold beverages, including iced tea and iced coffee, in much less time than it would take to make these drinks the old-fashioned way.